Toward the end of my juicing cleanse, the idea hit me to take the leftover kale (of which there was SO much) and make a stir-fry with cannellini beans. I pretty much love all beans and figured that on day 2 of post-cleanse eating, I’d be able to introduce some of my favorite legumes back to my belly. In addition to my reintroduction to the mighty bean, last night was my first meal of non-raw ingredients. It had been a looooong time since I’d had something cooked and boy was it nice. Just by using up some of my random leftover ingredients (and the addition of a few new others), I created a recipe that I thought was amazing and I think you’ll agree. 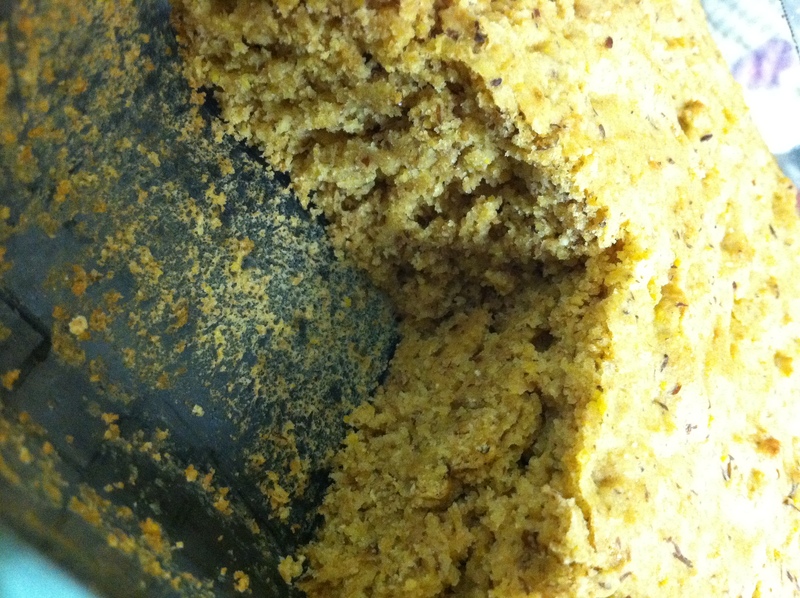 I used sprouted tofu instead of regular as it is easier to digest than regular tofu AND more nutritious. 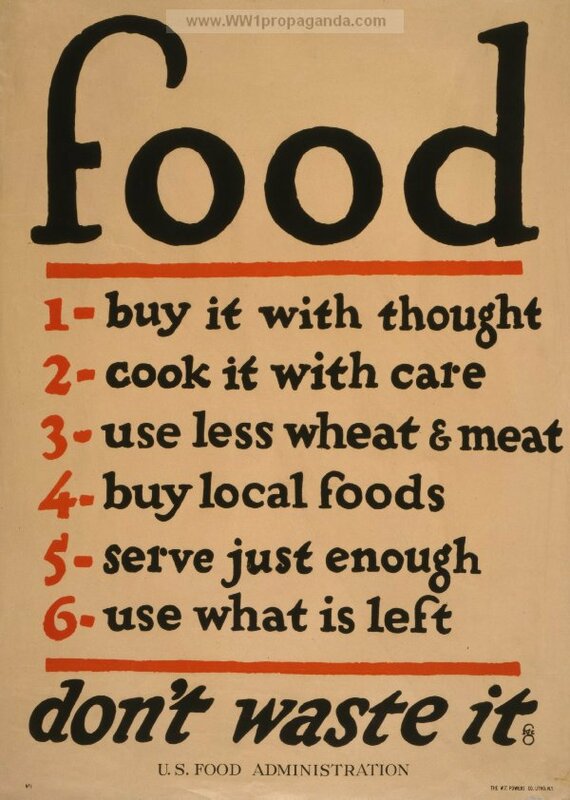 I strongly suggest giving it (and anything else sprouted — including my favorite sprouted wheat multigrain Alvarado Street bread) a try! Also, if you get a chance to visit the Spice and Tea Exchange in Georgetown, they have an amazing selection of spices and spice blends, including the Moroccan Spice blend that I used. 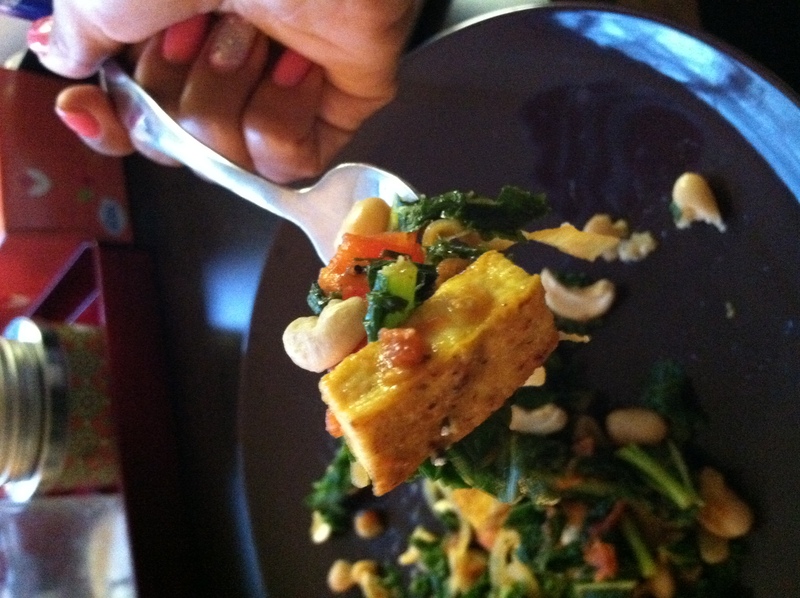 Sprinkle both sides of tofu cubes with spice blend. 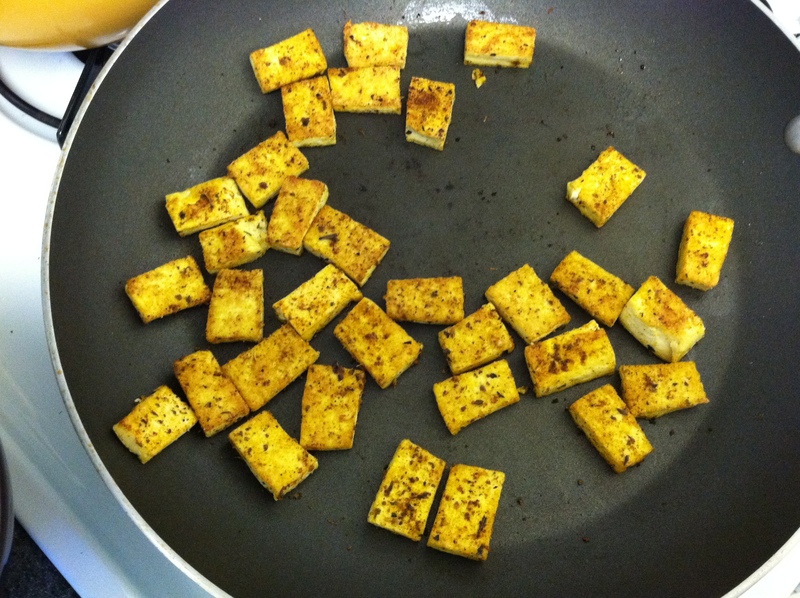 Pour a bit of olive oil into a heated frying plan and place tofu cubes in a single layer. Saute tofu for 3-4 minutes. Once tofu is browned on the bottom, flip each piece over and cook for another 2-3 minutes. 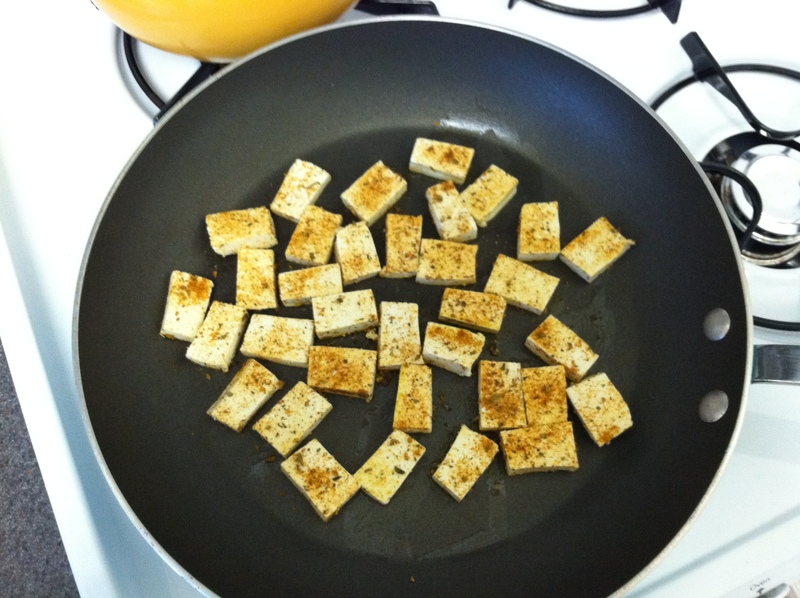 Remove sautéed tofu from frying pan and place aside. In a wok, heat 1 tablespoon of olive oil and cook onion and garlic until translucent and fragrant. Turn to medium-low heat and add tomatoes to the wok. Stir and let cook for a minute. 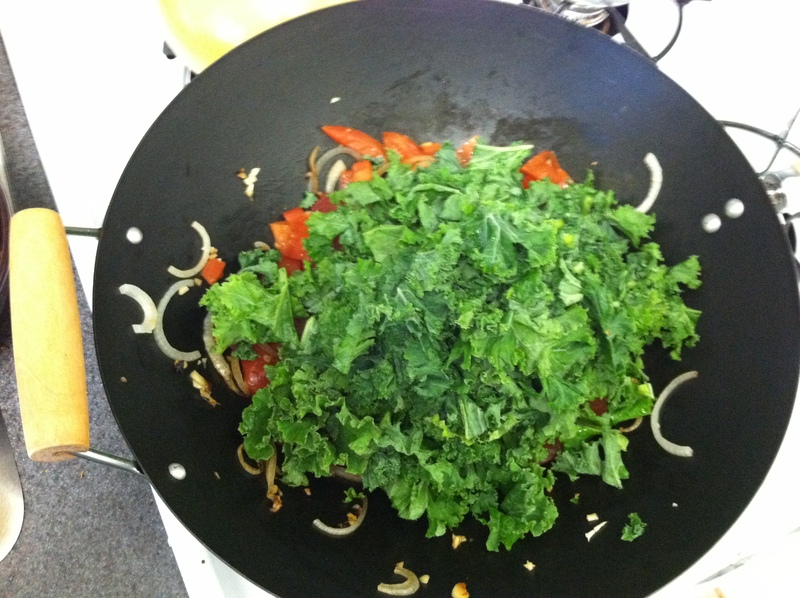 Add the kale to the wok. Add in the Braggs Amino Acids. Stir the mixture as the kale releases its water and wilts. Add the white beans and stir until they become warm. Add the tofu to the wok and stir and let simmer for 2 minutes. Top each plated serving with a sprinkle of raw cashews for added texture. Done. 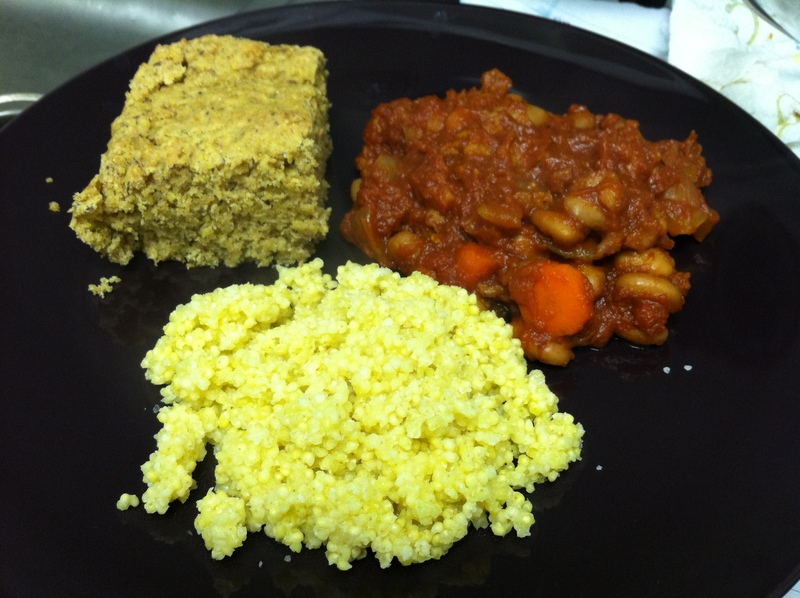 I promise that this tastes good…and it’s not out of desperation since I had previously been sans solids for 10 days. If I can keep cranking out recipes like these, being vegan for at least 5 days a week will be no problem at all. I will leave you with the perfect bite.